It should come as no surprise that even though President Barack Obama is the most recent edition to the list of our nation’s leaders, there is already a wealth of information regarding the First Family’s White House Christmas cards, where they spend the holidays, as well as their other holiday-related activities. Having two young children as members of the family certainly ensures that lots of attention will be paid to the Obamas’ goings-on during Christmastime. The fact that there was no printing of a biblical passage (as there was on White House Christmas cards for each year sent out by George W. and Laura Bush) nor an artist’s depiction of decorations in one of the rooms in the White House (as on Bill and Hillary Clinton’s selections) certainly brought out the critics. Among those voicing their opinion on the matter was Representative Henry Brown, a Republican from South Carolina, who introduced a resolution calling for the defense of the sacredness of the Christmas holiday. He said, “I believe that sending a Christmas card without referencing a holiday and its purpose limits the Christmas celebration in favor of a more politically correct holiday.” More than 40 Democrats and Republicans co-signed the bill. Little attention was paid to the Christmas cards sent out by the Obama family for the 2006 holidays, just a few months before then Senator Obama announced his candidacy for the highest office in the land. Politicians will oftentimes send out Christmas cards to not only friends and relatives but also to campaigners, to people who in the past may have supported their candidacies financially or otherwise, or business professionals. Lori Bowen Ayre, MLIS, who at the time was head of the Galecia Group, a network of technology professionals, received a Christmas card from her senator that had a great family photo of the four Obamas wishing her “Happy Holidays”. Rather than be offended, she was thrilled with the card, professing, “Just look at that picture! This guy is the perfect candidate. The whole family is appealing, direct and open. I want to be an Obama!” Obviously, there is much more intense scrutiny on the national level when one is president of the United States as opposed to being a senator from the state of Illinois. Certainly, there could not have been too many differences of opinion regarding the behavior or practices of events in which the First Family participated once the 2009 holiday season arrived. On November 27th, the day after Thanksgiving, Michelle Obama along with First Daughters, Malia and Sasha, accepted delivery of the 18 1/2-foot Douglas fir tree which was to serve as the White House Christmas tree – a practice of begun by President Benjamin Harrison in 1889. This tree, arriving on a horse-drawn carriage, was accompanied by its growers, who were invited into the White House for cookies and apple cider. It was the fourth tree Eric and Gloria Sunback of West Virginia had placed in the White House (the three others were for Presidents Jimmy Carter and Ronald Reagan). The 13-year-old tree was officially unveiled about a week later. As Christmas Day drew closer, President Obama, interviewed by singer Gloria Estefan, explained that Santa Claus would be entering the White House on Christmas Eve using the chimney in the Yellow Room, and that milk and cookies would be there for the red-suited man’s consumption. On December 22, the First Lady along with Malia and Sasha and the family dog, Bo (sporting a red-and-white collar with sleigh bells attached), paid a Christmas visit to the Children’s National Medical Center, visiting heart and kidney patients. They were then led to the center’s atrium area where Michelle Obama read Twas the Night Before Christmas to a larger group of children. Additionally, Malia and Sasha alternated reading from Snowmen at Night, a children’s picture book. On the day of Christmas Eve, the First Family boarded Air Force One for the long flight to Hawaii where they would stay in Kailua in a beachfront rental home for a week and a half. The Hawaii visit, an annual tradition for the Obama family, most certainly would bring back fond childhood memories for the man who was born in Honolulu on August 4, 1961. Barack Hussein Obama, Jr. was born to Stanley “Ann” Dunham from Kansas and Kenyan Barack Obama, Sr., a foreign student on scholarship. His parents were attending Hawaii State University in 1960 and had met while they were students in the same Russian language class. By 1963, unfortunately, the couple separated and was divorced the following year. Ann Dunham, a woman who travelled the world while working against social norms and was described as “the original feminist,” later married Lolo Suetoro, a manager in the oil business, who moved the family to Jakarta, Indonesia. However, after that second marriage ended, Ann lived again in Hawaii as well as Indonesia before moving back to Kansas, where she died in 1995. Barack, Sr., whose original plan was to be educated in America and return to his impoverished country to help lead it out of despair, relocated to Harvard University where he earned a PH.D. in Economics. Returning to his homeland of Kenya, he married an American woman and raised two sons, but never achieved his goal of becoming influential in his native land. Falling into financial trouble and having anger issues because of his perceived lack of success, Barack, Sr. became an alcoholic. In 1982, he was involved in a car accident and died. Due to his evolving family situation, young Barack was able to experience life in vastly different areas of the world. As a young child, he lived with his mother in Hawaii; from the ages of six to ten he resided with his mother and her new husband in Indonesia after which he returned to Hawaii to live with his maternal grandparents. He was known as “Barry” during his grade school years, and graduated from high school in 1979. It was when Barack was ten that he had his only other childhood contact with his father. It was during a month’s visit in Hawaii for the Christmas holiday that Barack, Sr. presented his son with a basketball as a Christmas present, a gesture which the future president later wrote was responsible for the beginning of his love for the sport. It was also during this visit that father and son had a heated argument over whether young Barack could watch How the Grinch Stole Christmas on television or whether he should go to his room and study. Needless to say, once the altercation had ended, young Barack had missed the show anyway. After Barack, Sr. left Hawaii, he and his son never saw each other again. As a youngster growing up, the fact that he was the product of a mixed marriage was something that never really occurred to him. He later wrote, “That my father looked nothing like the people around me – that he was black as pitch, my mother white as milk – barely registered in my mind.” What he did pick up from his parents, certainly, was intelligence and the will to work hard and to try to succeed. After leaving high school, Obama attended Occidental College in Los Angeles for two years. He then moved on to major in political science, specializing in international relations at Columbia University, from where he graduated in 1983. After working several years as an editor in New York City, a community organizer in Chicago, and as a consultant for a community development organization, Obama travelled in 1988 first to Europe and then to Kenya to meet his relatives on his father’s side for the first time. Upon his return later that year, he enrolled in Harvard Law School. During his time at Harvard he served as both editor and then president of the Harvard Law Review. The fact that he was the first black person to hold the highest office of such an esteemed publication earned him national headlines, which in turn led to a publishing contract for a book about race relations. The book became his personal memoir entitled Dreams from My Father, published in 1996. During his summers, he worked as an associate at the law firm of Sidley Austin. It was at the law firm where he met first-year attorney, Michelle Robinson. A native of Chicago, Michelle had graduated from Princeton University in 1985 and also earned her law degree at Harvard Law School, where she graduated in 1988. At first, Michelle, who was a full-time associate at the law firm and was a notch higher than summer intern Barack, was wary about meeting him. But soon, “I was charmed, and we became instant friends,” Michelle recalled. They soon began dating and Barack “swept me off my feet.” She quickly realized there was much substance to the man. At Christmas, Obama brought Michelle to Honolulu to meet his family. Accepting his proposal after a two-year courtship, the two were married on October 3, 1992 in Chicago. For more than a decade, Obama worked as a constitutional law professor and senior lecturer and as a law associate. He was first elected to the Illinois Senate in 1996 and re-elected twice thereafter, in 1998 and 2002. Running for the U.S. Senate from Illinois in 2004, he was chosen to deliver the keynote address at the Democratic convention, an appearance which was instrumental in his capturing 70% of the vote in that November’s election. 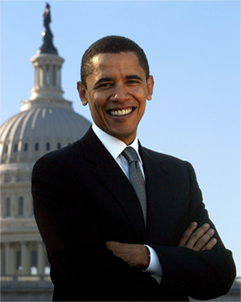 On February 10, 2007, Barack Obama announced that he was to be a Democratic candidate for President of the United States. Announcing his decision at the same place Abraham Lincoln delivered his “House Divided” speech 149 years before – in front of the Old State Capitol building in Springfield, Illinois – Obama talked about the issues he felt were important: the Iraq war, dependency on foreign oil, overcrowded schools, and the high cost of health care. After an initially close primary campaign against Sen. Hillary Clinton, Obama gained the lead in delegates and was declared the presumptive nominee on June 3, 2008. At the convention in August, he selected Joe Biden of Delaware as his vice presidential nominee. The general election against the Republican nominee, Arizona’s Senator John McCain and his relatively unknown vice president nominee, Sarah Palin of Alaska, ended with a Democratic Party victory by an Electoral College margin of 365 to 173. Indeed, it would be an extremely happy 2008 Christmas holiday for the Obama family! Following his inauguration as the President of the United States on January 20, 2009, Barack Obama would face many important challenges, especially during his first year in office: fixing an economy in the throes of a recession, winding down U.S. presence in Iraq while increasing troop strength in Afghanistan and reforming health care are among the many issues. His performance, and eventually how history will judge Barack Obama, is to be determined only after his administration ends and time passes. One thing is certain…as the first African American man elected United States president; he has a unique opportunity to positively influence the importance that relationships between different kinds of people can have on each other – like having the Christmas spirit all year long. I wonder from where President Obama will order his Christmas cards from. I’m sure his daughters are loving Christmas in the white house, it must be stunning. I would like to know how many Christmas cards were sent out this year by the Obamas. All I was able to find out so far is that 1.4 million were sent in 2005. Also, how many card were sent last year. Awesome website. Thanks! It’s not the Christmas Card. It is signed by the President and Mrs. Obama. I am not finding information on this. The envelope has a return address of raised letters “THE WHITE HOUSE WASHINGTON DC 20500. I would like any information you can give me. How many mailed, what is it,and is it hand signed? my own apartment, employed and doing very well. next 4 years! Thanks so much for supporting veterans around the nation. WHerever Obama orders his Christmas photo cards from would probably be an elegant company – he has to send out the best, and I am sure the recipients would expect nothing more. Looking forward to seeing it in the tabloids in December!! Interesting article. I learned a lot of things about the Obama family I was not aware of. I do hope someone publishes their holiday card this year. I’m curious to see what they choose and if they use a photo. I don’t think there is anything wrong with keeping some things private. Family traditions are sacred, I’m sure whatever they decided will be wonderful. Congratulations on your reelection. My partner and I have been together for 26 years and did our civil ceremony in Oregon, Il. Let’s have lunch and discuss Gay Marriage. We love the beautiful picture on the Christmas card. We would love for you to share one with us and get us off this cliff! I just saw this year’s White House Christmas card. It features a painting by an Iowa artist, Larassa Kabel. The card features Bo, the Obama’s family dog, in the snow in front of the White House. The dog is wearing a white scarf around his neck. As a dog lover, I think the card is delightful! The artist is thrilled and honored to have her painting chosen, especially as the artwork for the White House card is usually commissioned rather than chosen from a pool of artists. In lieu of payment, Kabel and her husband get to attend the White House Christmas party, which arguably is better than financial compensation! I received this card and also wonder if the signatures of the president and his lovely family are handwritten. If not, the technology has certainly improved! Since the White House sends out more than a million cards at holiday time each year, my guess is that the cards are not hand signed and, yes, technology has improved. Shame on President Obama! For the first time in decades, he has stopped sending a White House Christmas Card to those families of a POW/MIA. My dad was killed in 1968, never recovered, and these cards, over the years, have been a source of comfort for the extended family. When Mr. Obama took office, this practice ceased. It shows a complete disrespect for the loss of my dad in the service of his country. 14 responses for Obama and only 1 for George Washington? I don’t get it. What a difference between “The Father of our country” who chose to be addressed as “Mr. President” to the current resident of the White House who would probably prefer to be called “Your highness” by executive order no doubt! I needed to thɑnk you for tɦis fantastic read! !